Update 06/09/16: A previous version of this article stated that the draft legislation of the bill is an expansion of the Choice Program. The legislation is in fact an overhaul of the current Veterans Health Administration. All veterans who qualify for Department of Veterans Affairs health benefits would be able to seek care outside the VA under new legislation. Rep. Cathy McMorris Rodgers (R., Wash.) introduced a draft bill on Tuesday afternoon that would allow any veteran unsatisfied with his or her care at the VA’s network of government-run medical facilities to use their benefits to obtain care in the private sector. The bill, titled the "Caring for our Heroes in the 21st Century Act," aims to overhaul the delivery and management of veterans’ health care at a time when the VA is plagued by long wait times, insufficient care, and other failings. The VA already allows some veterans to seek care at non-VA health providers as a result of legislation enacted after agency staffers were found keeping secret lists to conceal long waits for care in 2014. The controversy led to the establishment of the Choice Program, which allows veterans waiting over 30 days for VA appointments and veterans who live far from VA medical facilities to obtain care outside the VA. The draft legislation unveiled by McMorris Rodgers would let any veteran who currently receives VA benefits and is unsatisfied with his or her care to seek care at private facilities with financial support from the VA.
Veterans would also be able to enroll in the Federal Long Term Care Insurance Program, a benefit that is currently only available to VA employees and other federal officials. They would be able to purchase alternative long-term care insurance in the private market with premium support. Evidence shows that public opinion is behind an effort to offer veterans more health care options and expand the Choice Program. A Gallup survey released in March found that more than nine in 10 Americans believe that veterans should be allowed to get health care at any provider that accepts Medicare, not solely at VA medical facilities. McMorris Rodgers’ bill would also restructure the VA’s system of hospitals following an independent assessment released last September that the VA system required "system-wide reworking." The bill would reform the Veterans Health Administration by separating its payer and provider functions. It would create the Veterans Accountable Care Organization, a separate government corporation that would be responsible for managing the VA’s medical facilities and delivering care to veterans. Additionally, the legislation would create the Veterans Health Insurance Program to administer veterans’ health insurance programs. The bill would also set up an independent, nonpartisan 15-member commission of health care experts and veterans to track the law’s implementation and make recommendations to Congress and the VA about veterans’ health reforms. The VetsCare Advisory Commission, modeled after the Medicare Payment Advisory Commission, would be tasked with reviewing the quality of veterans’ care. For instance, the commission would be able to propose closing certain VA medical facilities that are underused to free up funds for use elsewhere. Concerned Veterans for America, a veterans group that has advocated for reform at the VA, lauded the bill in a statement Tuesday afternoon. "The [bill] will reverse the tide of inefficiency and failure at the VA while offering veterans the health care choice they deserve," said Dan Caldwell, the group’s vice president for political and legislative action, in a statement. "While the usual chorus of special interests and entrenched bureaucrats will fight to protect their political power, Congress must do the right thing by standing with our veterans and implementing this commonsense legislation." The latest effort to streamline veterans’ health care comes in the wake of agency data showing rising wait times at VA medical facilities. Over half a million veterans currently have waited more than a month for appointments, according to numbers released last week. Veterans Affairs Secretary Robert McDonald drew ire from Democrats and Republicans last month for comparing veterans’ waits for appointments to lines at Disney theme parks and arguing that wait times are not a valid metric of success for veterans’ satisfaction. "When you go to Disney, do they measure the number of hours you wait in line? Or what’s important? What’s important is, what’s your satisfaction with the experience?" McDonald told reporters on May 23. "And what I would like to move to, eventually, is that kind of measure." The statements prompted demands for McDonald’s resignation. The secretary later expressed regret for the comments, though he would not explicitly apologize for them. President Obama has championed McDonald despite controversy, telling the Colorado Springs Gazette in an interview last week that the secretary has "done a terrific job." Obama appointed McDonald to the top post at the VA after his predecessor Eric Shinseki resigned during the wait list controversy. The president has also claimed that veterans are "extremely satisfied" with VA care once they receive it. 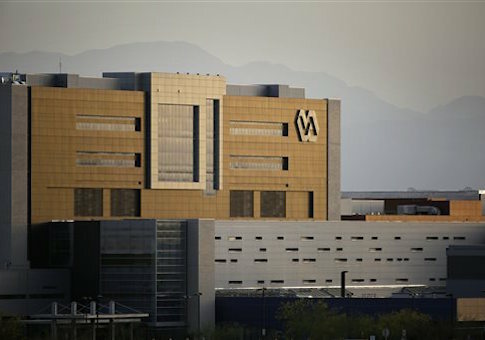 "The notion of dismantling the VA system would be a mistake," Obama told the Gazette in the interview published Sunday. "If you look at, for example, VA health care, there have been challenges getting people into the system. Once they are in, they are extremely satisfied and the quality of care is very high." Auditors with the Government Accountability Office recently concluded that the VA does not perform enough oversight to ensure that veterans receive timely care.